Longfellow’s Acadian heroine Evangeline stands in Port Royal. 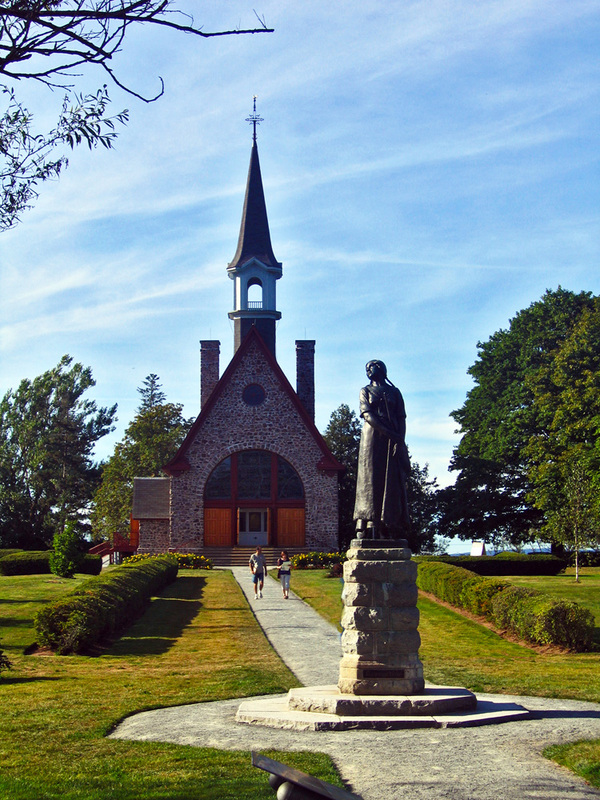 The Acadians have kept French language and culture alive in Maritime Canada. And they took these to Louisiana where it still survives as Cajun. 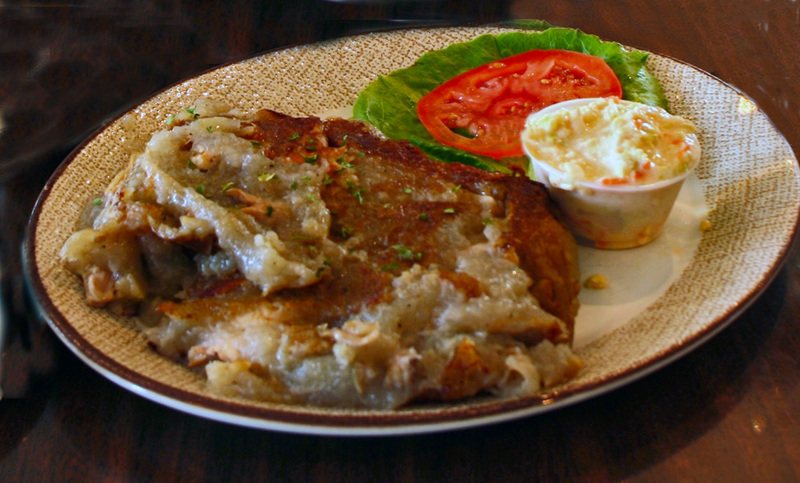 But somehow, Louisiana never inherited their real culinary gift – Acadian rappie pie. In 1605, Sieur de Mons and his cartographer, Samuel de Champlain, began the first settlement of Port Royal. This is the oldest settlement in North America apart from St. Augustine, Fla. The beauty of the Bay of Fundy and its sheltered harbour had long been known to the Mi’kmaq people who had lived here for centuries. 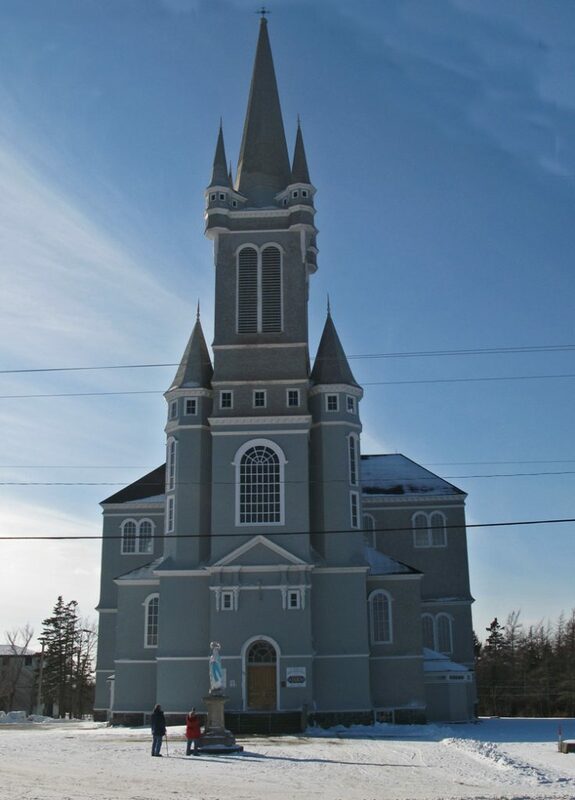 The French and Mi’kmaq began a long and enduring friendship in the land that became known as Acadie, possibly from the classical name, Arcadia – a place of lasting peace. And the French settlers here were Acadians. But the war between France and England in the mid 18th century destroyed their peaceful existence. Concerned that their loyalties would naturally lie with the French, the British forcibly expelled more than 6,000 Acadians from their homes and from the land they loved. Many died; others made it to Louisiana, then a French colony. They were the forebears of the present-day Cajuns. And when it was over, some returned. But of all the exiles, only those from one tiny village nearly all returned to their original homes. Perhaps because no one else wanted to live in such inhospitable surroundings, the lands around West Pubnico, Nova Scotia hadn’t been confiscated. Calvin, like most locals, makes his living as a fisherman – lobsters in his case, but scallops, herring, cod and haddock are all pulled out of the waters here. Many huge fish plants once dotted the shore, but today, only five remain. Nonetheless, fishing is still vital. 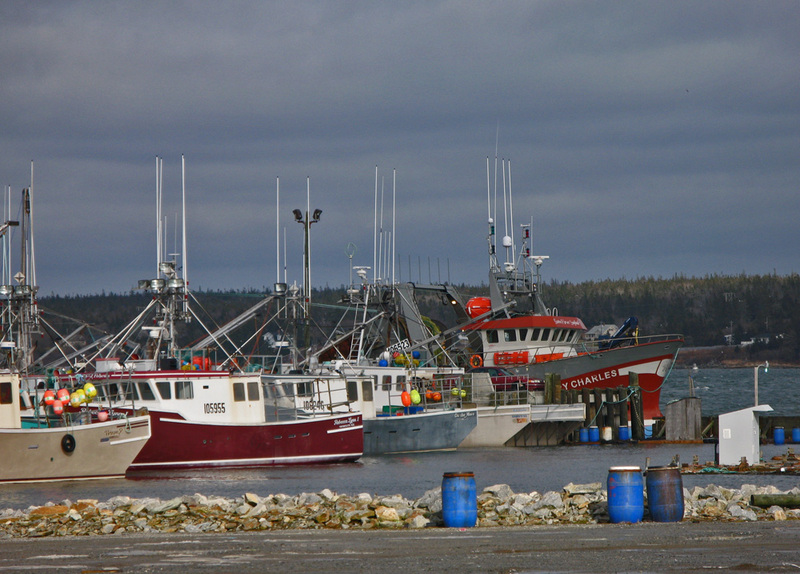 On the last Monday in November – Dumping Day – the lobster boats line up early. At 5 a.m., the entire town (no one sleeps in on Dumping Day), cheers the boats as they rush full throttle out of the harbor to drop their lobster traps for the first time. It’s a race to get the best spots. For the next six months, through icy winter weather, these intrepid fishermen go out to lift the traps and collect the luscious crustaceans which find their way onto menus all over North America. 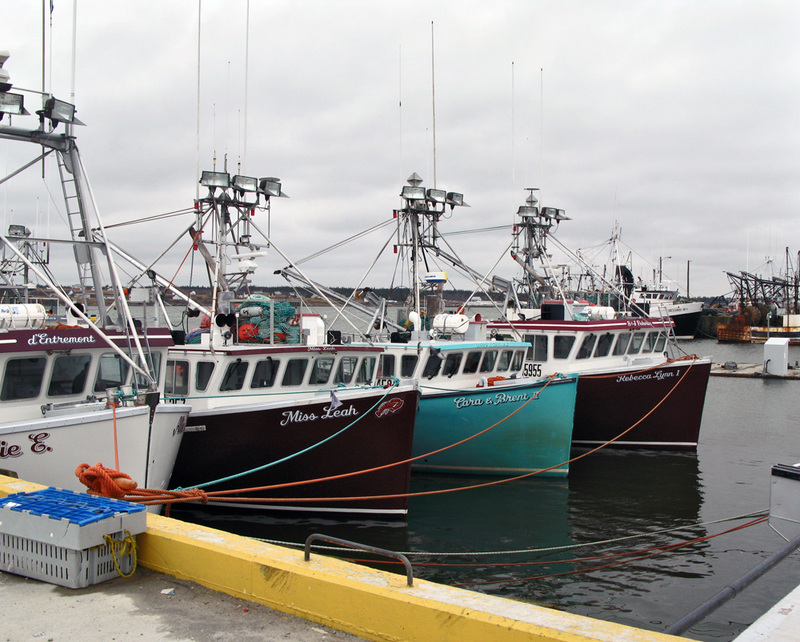 Rows of lobster boats are lined up at the wharf when I visit. But there’s a storm coming so the fishermen are all in the Dennis Point Café, opposite the pier. Weathered faces crease into smiles of welcome as Calvin introduces a cousin, an uncle, another cousin. 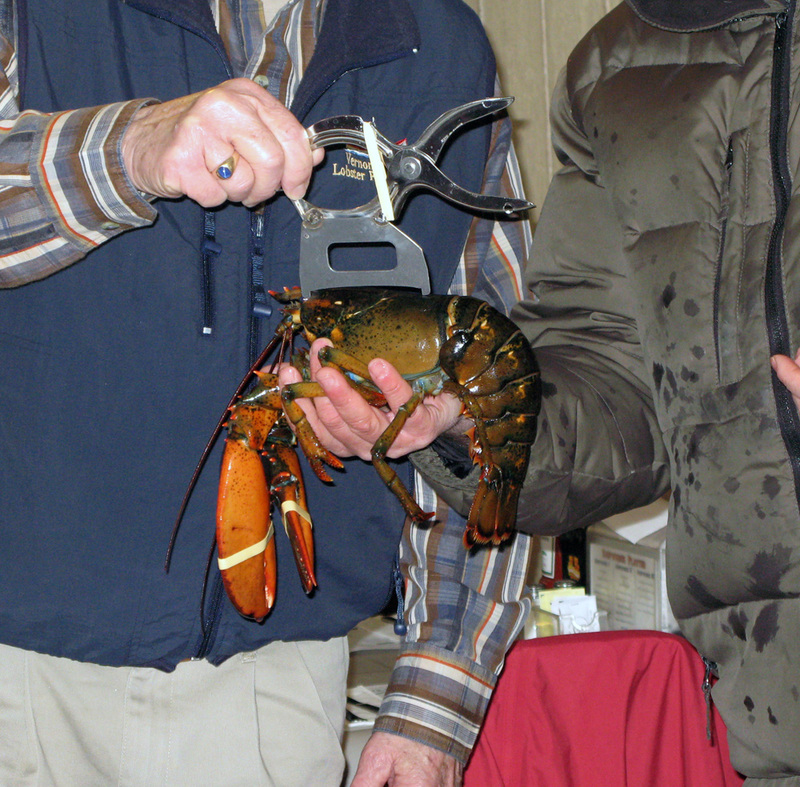 Lobster, its claws closed with elastic, is able to be measured. They’re all d’Entremonts except for Vernon D’Eon, owner of the café. The D’Eon family (the only other name of any significance in this area) once made lobster plugs – the little wooden pegs that were pushed into the edge of a lobster claw to prevent it nipping a finger. Today these have been replaced with elastic bands and D’Eon and Calvin give us a demonstration of how they snap one of these over the claw using a small stretcher. 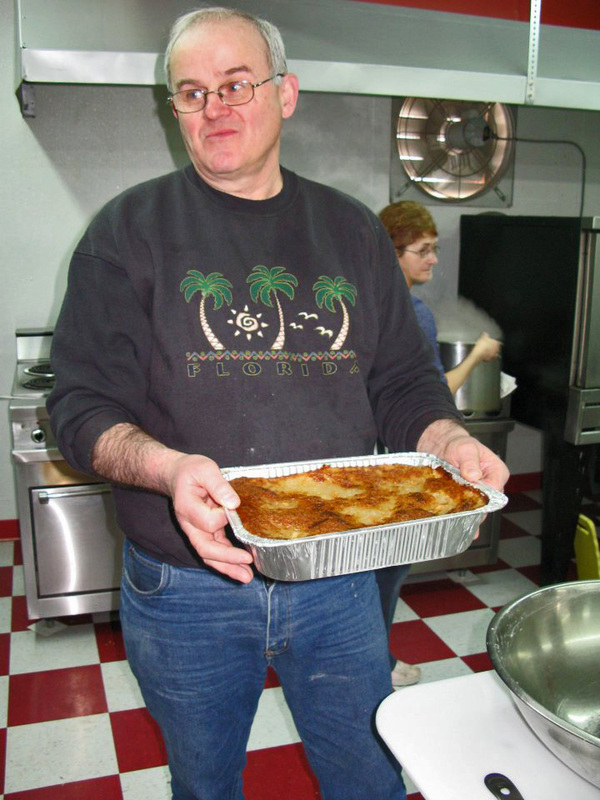 Clayton D’Eon holds one of the golden-crusted large rappie pies,. Why not make it yourself, you ask? It looks simple enough and you might be forgiven for thinking it’s a chicken version of traditional shepherd’s pie. But it takes a dedicated cook to go through all the work required to prepare rappie pie properly. In fact, another D’Eon is counting on that fact. His company, D’Eon’s makes and sells this Acadian specialty throughout the province. Rappie pie’s origins aren’t really known but the name comes from the French word, râper, to grate. Aptly enough, the dish starts with grated potatoes which has led some to speculate that it originated from German potato pancakes or Polish placki kartoflane, but there’s probably no other cuisine that goes the next step. Once grated, the potatoes are gathered in cheesecloth and drained of all their liquid. This is carefully measured. Helène Leblanc, owner of the Red Cap Restaurant in West Pubnico, demonstrates the process for me. She fills a pillow slip with the grated potatoes, then twists it tighter and tighter, squeezing out the last drops of liquid. 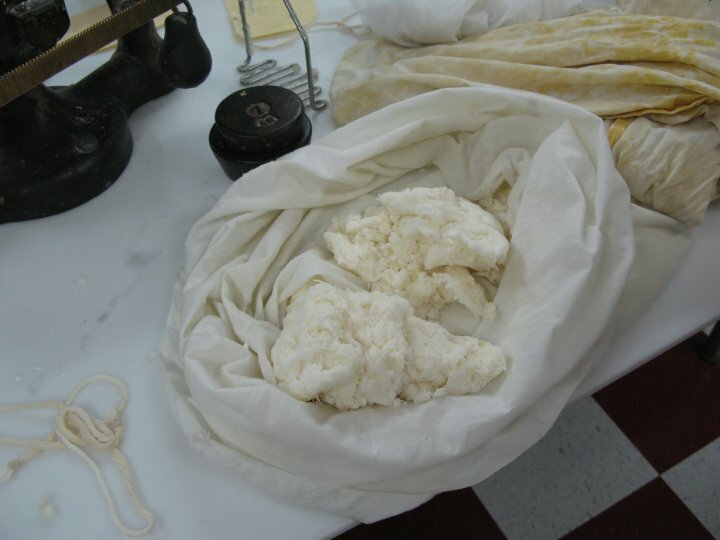 According to one historian, this liquid was used to starch the crisp white linens of the good Acadian housewife. 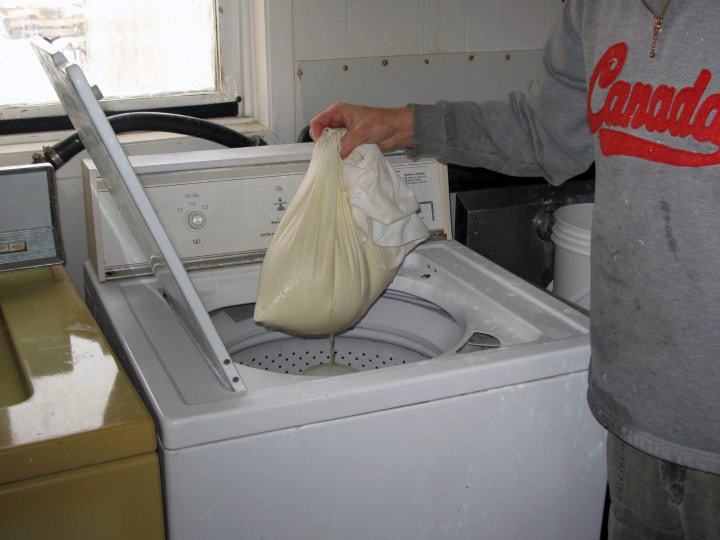 If so, it would be typical of the thrifty Acadians to find a wonderful use for what would be wasted. What’s left inside the pillow slip is a dry, grayish mass that looks particularly unappetizing. Meanwhile, in a large pot, several chickens are cooked in enough water with salt, pepper, onions and celery to create plenty of broth. Note that I said several – rappie pie isn’t a dish for family dinner. It’s generally made in quantity for a celebration. The birds are removed, cooled, then completely de-boned by hand. Are you starting to see the scope of the project? Putting pies into the oven at D’Eon’s. The drained broth is brought back to a boil and the hot liquid slowly added to the dehydrated potatoes in exactly the same quantity as that which was removed. Some people add chopped onions to this mixture, but Leblanc is a purist – only salt and pepper allowed. A deep pie dish is filled with half the potato-stock blend. This is topped with generous strips of cooked chicken (there’s no effort to maintain consistent size) and this is topped with more large, frothy mounds of the potatoes. The next step is individual. Leblanc prefers dotting the potatoes with small knobs of butter; others use pieces of bacon or lard. The aim is to provide some sort of fat which crisps the surface of the pie as it bakes in the oven. My first bite is a revelation. Shepherd’s pie never tasted so succulent and rich. The chicken broth gives the potatoes a gorgeous flavor and the crisping on the surface is so good that “there’s usually a battle to get the crusty parts,” laughs Leblanc. Rappie pie is always made for get-togethers – a wedding, a christening, a party, a family gathering, even a wake. “It’s just a given,” says Leblanc, which is why, with the hectic lifestyle of modern day Acadians, D’Eon’s Rappie Pie, a commercially produced version, is gaining such popularity. Still handmade, D’Eon use two pieces of equipment traditional Acadian women would not. The first is an electric potato peeler to peel the spuds, though the last of the eyes are still removed by hand. The second is the way the company extracts liquid from the potatoes. They’ve eschewed pillow slips for the spin cycle on a standard washing machine! In fact, they sell as many packages of dehydrated potatoes as they do baked pies. Saving this step of the work is patently a boon but adding the right amount of broth to achieve exactly the right consistency then becomes a bit of a test of skill. 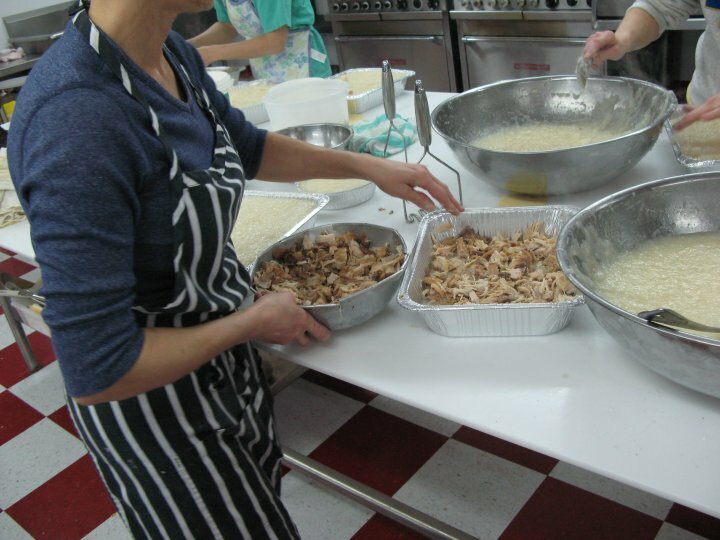 I watch the women debone the chickens and assemble the pies by hand. It’s a lot of work. D’Eon’s pies are available in stores around the area but nowhere outside Nova Scotia. Ste Marie Church is the largest wooden building in America. It’s a beautiful building and an Acadian treasure. Now, there are many reasons to visit the Acadian Shore. Along this coastline, ocean and land come together with spectacular confluence. 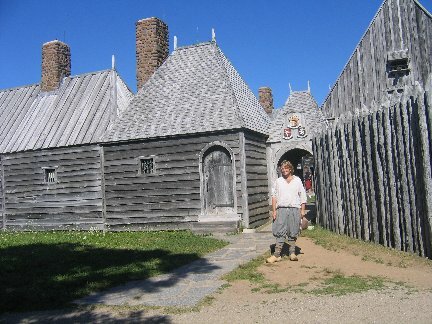 There are interesting Acadian historic sites throughout the province. The Acadian people remember their beleaguered history without rancor and retain the same welcoming bonhomie and joie de vivre so evident in the Cajuns of Louisiana. These are all good reasons to visit, but when you come, make sure you get a taste of rappie pie. This entry was posted in Food, Nova Scotia, Recipes I Love and tagged rappie pie by Liz Campbell. Bookmark the permalink.